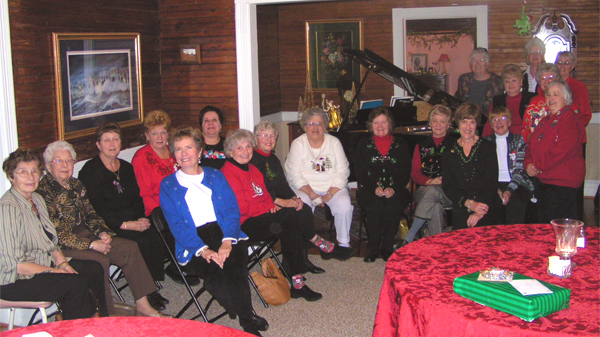 Our Lady’s Circle has been an active group within Sacred Heart Church for many years. It is a group of women who assist with various need of the parish. There are no dues assessed, and the group meets once a month during 10 months of the year, usually on the second Sunday of the month after Mass, taking the summer months of July and August off. The group would like to encourage additional women of the parish to join us. It’s a great way to meet women of the parish and to contribute your ideas and talent to the parish. We encourage ‘weekenders’ as well as full-time parishioners to join us. If an annual commitment is too much, perhaps you can assist with the yard sale, and just participate for a couple of months or for that single function. The organization is a dues-paying member of the Atlanta Archdiocesan Council of Catholic Women, and as such select a Woman of the Year, who is honored at a luncheon hosted by the Archbishop and AACCW in Atlanta. Host many food-centered functions such as the annual Christmas Cantata, Habitat for Humanity lunches, special event finger foods, etc. Fund raising for parish needs above and beyond those budgeted for by the general funds of the parish. In addition, the group considers taking on other projects at the requests of Father Kane, the Parish Council and other parishioners. The major fund raiser this group organizes is an annual yard sale, plant sale, bake sale and raffle which is held in the spring of each year. These proceeds have been used for items and functions such as funeral luncheons, the chairs on the altar, Christmas decorations, “Together We Can” Building Campaign, help with the Memorial Garden fence and benches for the Memorial Garden , flowers for the altar, tables for the Fellowship Hall, new purificators, curtains and blinds, flatware, etc. Women are welcome to participate in some or all of the functions hosted by Our Lady’s Circle.